On an otherwise very overcast Saturday afternoon on Mamaroneck Avenue, it may not have been sun, but something was certainly shining down on Archbishop Stepinac (8-4), as everything that possibly could go right did for the red, white, and blue juggernaut in their 49-7 victory over visiting St. Francis (5-7) in the Catholic Football Triple-A State finals…1-4 on October 6th, the Crusaders closed out the 2018 season on a seven-game winning streak. The second consecutive state crown and the third overall (beat St. Francis in 2015 as well) in program history, Stepinac became the first school in the five-year existence of this contest to both repeat as champs on behalf of their respective region and taste victory on home soil. 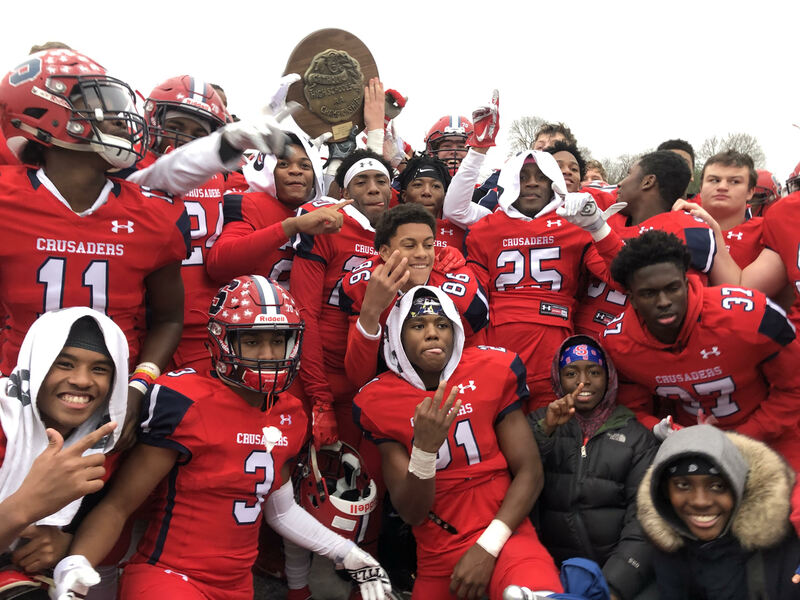 Building a 42-7 lead at the break, Stepinac would need less than two minutes to get on the board when a Kevin McKenna blocked punt was scooped up by Mekhi Green and returned to the house to give the Crusaders the initial 7-0 lead. Things would continue to break the way for Head Coach, Mike O’Donnell’s boys on their first official possession of the game when after forcing a turnover on downs via back-to-backs sacks, they would culminate a 68-yard drive with 4:41 remaining on a mishandled snap that junior quarterback, Joey Carino, was able to gain control of and scramble for the four-yard touchdown run to make the score 14-0….Prior to the TD run, it was the Crusader’s star tailback, Malik Grant, breaking for a 20-yard gain to move the ball within striking distance (the 4-yard-line) for his schools. With the defense, led by standout performances by–McKenna, Brendan Wilkins, Kevin Gray, Doug Simmons, Zach Barnes, Dexter Chance, Michael Tartaglia, Joe Garbowski, and Nermin Metjajic—flying at Red Raider sophomore signal caller, Jake Ritts, from all angles (10 sacks in the first half; 12 total), the White Plains based program would make it two straight offensive possessions that yielded points when on the first play following a St. Francis punt, Carino would hook-up with his favorite target, Shawn Harris Jr. On a 50-yard screen pass to the promised land to make the game 21-0 at the end of 12 minutes. Forcing another turnover on downs approximately four minutes into the second stanza on a dropped 4th & 1 pass attempt, the two-time NYCHSFL titlists took possession at the opposing 36 but did not stay there for long, as Carino played pitch-and-catch with junior WR, Quentin McCauley, on a 33-yard connection to further increase the advantage…Not credited with a catch prior to today, if you are going to pick a moment to get your name in the box score, McCauley absolutely chose wisely. Never ones to concede, the Monsignor Martin league champions [St. Francis] would temporarily climb back into the game and establish some momentum when they converted on a pair of 3rd & longs (17 and 20) on pass completions to Xzavier Janczylik and Antonio Corsi to extend their mid-second quarter drive and then capped off the series when Ritts went back to his sophomore Tight End [Corsi] on a seven-yard dart to cut the deficit to 28-7. The excitement among the Athol Springs faithful was short-lived though as Stepinac responded by tacking on their fifth and sixth touchdowns of the half in the final 3:00, as Harris and Grant both scored the final touchdowns of their respective decorated scholastic careers…In the case of Harris, it would be another screen pass for 62-yards that resulted in his 16th score of 2018…. :08 still showing in the clock, Grant took a page from Carino’s book, picking up a fumbled snap on the 4-yard line and dashing cross the line for his 10th running score of his swan song. Following a scoreless third quarter that concluded on a failed 4th down attempt by the Red Raiders inside the Stepinac 16, the Crusaders tacked on one additional touchdown with 9:26 to play in regulation as Carino put an exclamation mark on a five-TD (four throwing, 1 rushing) effort by hitting McCauley for the second time in the afternoon from 20-yards out…Carino finished his junior campaign with 26 touchdown passes (12 in the postseason). The outcome decided long ago, St. Francis’s made one last push to draw closer, but would see their final series of the season disrupted by A.S. 12th-grade OLB, De’Andre Smith, created a moment he will forever cherish in his last game by intercepting Ritts in the end zone as the clock dipped under 4:00. It was the first pick of the year for the 5’9, 170-pounder out of Cortland Manor. Exhausting the remaining time by alternating between McKenna and CJ Wise on the ground, the celebration would commence for a senior class (27 members) that went a perfect 8-0 as upperclassmen in the postseason. The Stepinac athletics’ twitter account posed the question, how do you want to be remembered? And for this very special group, the only acceptable answer was, AS CHAMPIONS!! !